Nearest: Tube Station: Russell Square 334 yards (305 metres), Railway Station: London Euston 0.4 miles (0.6 km), DLR Station: Tower Gateway 2.5 miles (4.1 km), Motorway: M1 Junction 1 5.4 miles (8.7 km). There are 6 tube (underground) stations within half a mile (0.8 km). 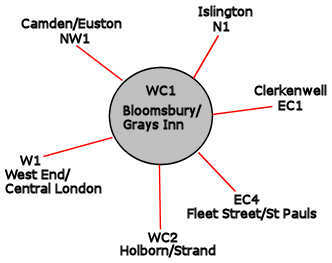 The Tavistock Hotel London is centrally located just North East of Centre in a location called Bloomsbury. Opposite hotel hotel is Tavistock Square the centre of which is a small open space with the feel of an urban park. The hotels location is convenient if you need access to the City of London (financial area, square mile) being close to Holborn which is the area between the west end and the city of London. There are are many shops, restaurants and amenities in the surrounding area notably in Southampton Row and the Brunswick Shopping centre (just north east of Russell Square). Russell square is just south of the hotel and is a main artery route for through traffic into central London. For this reason it remains busy at most times of the days. Just passed Russell Square you come to the main central parts of London, its theatreland and main tourist areas. The closest sections being Convent Garden and Soho which are both within 1 mile. Half a mile south west of the hotel is St Giles Circus which marks the beginning of Oxford Street, one of London busiest shopping areas. Nearest attractions include the Petrie Egyptian Archaeology Museum (0.26 miles), British Library (0.33 miles), British Museum (0.42 miles), Pollock's toy museum (0.42 miles) and Dickens House (0.53 miles). The Tavistock is an Art Deco styled Hotel dating back to 1935. Room amenities include en-suite, key-card locks, satellite television, internet access, radio and tea/coffee making facilities. It is possible to make a request for a computer point. There is a lift serving each floor. A limited hours room service is available. On the hotels ground floor can be found the hotels Tav bar (features a 1930's style), the hotels restaurant and the Jacques wine bar offering full a la carte menu. Jacques has a sun terrace area where meals can be taken. Business travellers may wish to make use of the hotels meeting room which features high speed internet access. The main front desk is staffed at all times, day and night, and have safety deposit box facilities. Concierge desk in Tavistock Hotel lobby. Guests receive concessionary rates for the Health Club and American style bowling alley adjacent to the hotel. Royal National Hotel: is 139 yards (127 metres) away, has a guest satisfaction score of 60% and rates start from about £60. Morton Hotel: is 232 yards (212 metres) from here, earns a customer rating of 90% and base rates begin at about £195. County Hotel: 281 yards (256 metres), rated at 60% and with rates from around £66. President Hotel: 401 yards (366 metres), rated at 70% and with rates from around £62. Compared to other London hotels: This hotel has been rated 70% by past guests. The London average is 80% and the average for 2 star hotels is 68%. Therefore while the hotel is below the overall London average you should note that this hotel is above average for its sector (star rating) . Imperial Hotels across the chain average 71% so this hotel is slightly below the guest rating for most Imperial hotels. Milesfaster ranking: 729th from 866 London hotels, 3rd of 7 Imperial Hotels, and 37th of 70 two star rated hotels. Another to Consider: Another hotel that is much like the Tavistock Hotel and not too far away (0.7 miles, 1.2 km) would be the 2 star Ibis Budget London Whitechapel, where prices begin from around £50 and which has an 80% guest satisfaction rating. The Ibis Budget London Whitechapel also offers: free WiFi. If you are looking for something a bit cheaper then take a look at the Generator Hotel. 2.3 miles away (3.7 km), gaining a satisfaction rating of 74% from its past guests with base rates starting at about £16 (theres free WiFi too). Prefer a tried and tested hotel close by judged by its guests ratings? We think the 3 Star Motel One Tower Hill stands out in that regard. The Motel One Tower Hill is only 0.2 miles (0.3 km) away. A highly rated hotel with a guest score of 90%. The closest fifty hotels around this area (Tavistock Square, WC1 postcode) that are listed on this website cover a 0.5 miles (0.8 km) radius. The numbers for each star rating are 4 five star hotels (average rating 88%), 21 four star hotels (average rating 82%), 17 three star hotels (average rating 76%), 6 two star hotels (average rating 72%) and 2 one star hotels (average rating 62%). Top 2 star hotels are Generator Hotel and the Crestfield Hotel (both 77%). The highest rating goes to Montague On The Gardens Hotel (4 star) at 99%. Base Rates: We look at what the average base rates are for the area and by star rating. These rates do not take account of offers and short term deals so are just a guide. If we look at the average for all hotels in the area (nearest 50) we get an average base rate of £105 per night. The lowest rates are at £16 at Generator Hotel (2 Star, 77%) and highest base rates of £312 at Charlotte Street Hotel (5 Star, 92%). Averages for each sector of star rating: Five Star average: £208, Four Star average: £125, Three Star average: £82, Two Star average: £48 and One Star average: £53. We rank hotels based on their guest rating but balanced for their influencing factors. We have ranked Tavistock Hotel 42nd (joint) of 50 nearby hotels and 5th for the 6 two star hotels in the area. Our ranking for sheer lowest base rates is 5th of 50 (2nd of 6 two star hotels.). We calculate an overall ranking combining the rates and rating scores. This hotel ranks 20th of 45 for pure value for money (Generator Hotel was top).